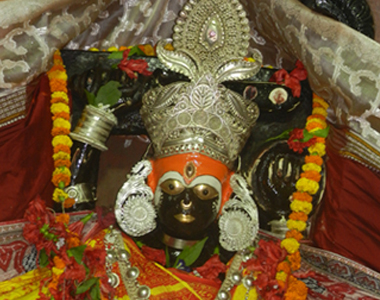 The famous temple of Goddess Bhadrakali is located in the outskirts of the revenue village Aharapada which is at a distance of 8 kms away from Bhadrak town in the south-west direction. One has to go via Santhia and Utarabahini in the south-west direction of Kacheri Chhaka of Bhadrak town to reach the shrine. The popular belief is that the name of the Town has been derived from the name of the deity.According to legends originally Bhadrakali was worshiped inside a cave in the Meghasana hill of Mayurbhanja district by a sage named Tapasa Russi. After the death of the sage, one of his pupil namely Bhadranatha brought the goddess to Bhunyamahalla of Bhadrak. The Bhunya community brought a priest community called the Dixits from Jajpur to perform regular seva-puja & niti (daily worshiping and care taking). The Dixit community is believed to be originally from north Indian region of Kanyakubuja. To protect the goddess from the wrath of the Muslim invader namely Kalapahada the Bhunyas and the Dixits brought the goddess to the present place i.e Aharapada on the bank of the river Salandi The last Independent King of Odisha Gajapati Mukunda Dev established the statu of Lorg Jagannath, Lord Balabhadra and Devi Subhadra at Bhadrakali pitha. There are a number of folktales and historical opinions regarding the goddess, "Maa Bhadrakali" and the "Pitha". Despite the same the Pitha has been a place which has always attracted devotees from all over the state and the country be it for worship by the commoners or by the Tantra Sadhakas (Tantriks).